This delicious appetizer is sort of a family tradition for things like birthday parties, Christmas, Easter, Thanksgiving…basically any time my siblings get together someone brings stuffed mushrooms. They are a little bit of heaven. The last time I made these I added a handful or two of fresh spinach sliced into skinny ribbons and used Gruyere cheese because that’s what I had in the fridge. Oh. My! They were amazing! So amazing, in fact, that I got out my big, fancy camera and decided to photograph them for you instead of eat them all immediately. You’re welcome. 1-1.5 lbs. crimini or button mushrooms, de-stemmed and washed. Put the Italian sausage into a good sized skillet and let that brown up nicely. I always add the garlic and onion while the sausage is browning to soften them up a little bit. While that is browning you’ll need to de-stem the mushrooms. Pop the stem out, and with a small melon baller or a sturdy (metal) teaspoon scoop out a little more of the insides – the filling is much tastier than the mushroom, make a little nest in each mushroom to capitalize on the filling-mushroom ratio. You can either toss the part you scoop out, or you can toss it into the filling (I add it as I scoop it while the meat is browning). When your sausage is cooked, let cool a bit and pat dry with a paper towel. Stir in the Neufchatel and grated cheese, add nutmeg, salt, and pepper. Stir in the spinach and combine well. ( You can keep this in the fridge for a week or two and fill a few mushrooms at a time for lunch ro snacks or whatever. Or you can use the whole batch for a party. If that’s your plan, please continue reading.) While the mixture is still warm, scoop it into the mushrooms. 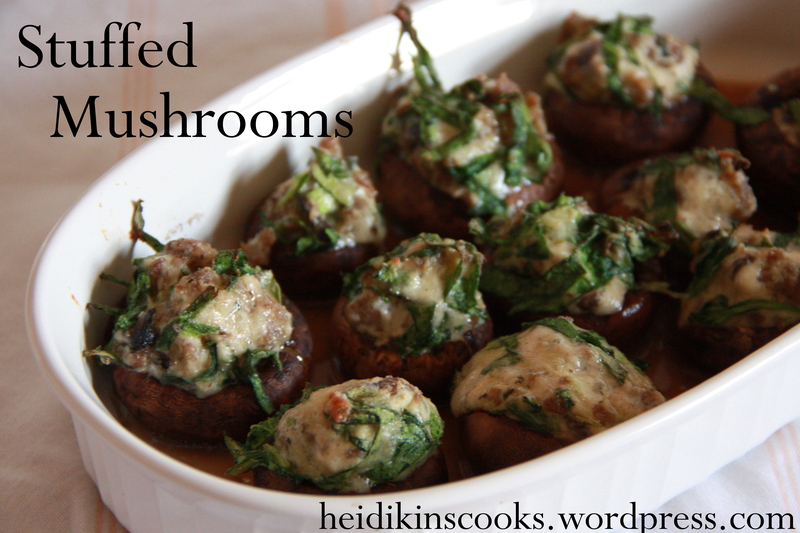 Now, if you are putting these in a glass pan like a 9×13 or other casserole dish, you need to fill it up with as many mushrooms as will fit and then bake for 30-40 minutes, until the cheese is nice and melty. If you put them on a baking sheet lined with parchment spaced a bit farther apart you only have to cook them for 15 minutes or so. Keep an eye on them, if they get too cooked the cheese will melt completely and run out of the bottom of the mushrooms leaving a crusty sauce on the bottom of the pan that your guests will have a much more difficult time appreciating than if that delicious cheese stayed inside the mushroom and, ergo, ended up in a mouth. Just sayin’.